Throughout this three part blog series, real world scenarios, health & safety concerns, cost savings, mold prevention, and industry best practices for proper sensor selection relating to building humidity levels will be reviewed and analyzed. Part 3 examines the best practices for selecting the right humidity sensor for wall mount, duct mount, or outside air along tips for field replacement. When specifying relative humidity transmitters, it is important to use a capacitive sensor line with full-scale accuracy of 0-100 percent RN measurement with NIST traceability. These sensors offer accurate humidity readings with active or passive temperature sensing capabilities available in ±2%, ±3%, or ±5% RH accuracy. The ±2% sensor is ideal for critical applications such as hospitals or printing operations while a ±5% unit is typically specified for office buildings. Wall-mounted transmitters are low-profile units that are esthetically attractive to please the architects and engineers that design the systems as well as the occupants that will work in that environment. Most units are easy to install and should take up no more than a wall thermostat or electrical outlet. They should be located where they will be exposed to unrestricted air circulation that is representative of the average humidity of the controlled environments. Locations with excessive moisture, fumes, vibration, or high ambient temperatures are present should be avoided. 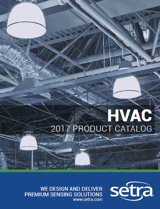 Duct-mounted transmitters should be mounted so the sensor probe is in the center of the duct, about 5 to 10 feet from fans, filters, cooling/heating coils and corners, to ensure even air flow. Because duct-mounted sensors are located near the outdoor air intake, they will be exposed to contaminants affecting the sensor. These transmitters should be checked annually due to the increased exposure to contaminants and will likely require yearly calibration. Outside-air relative humidity sensors should be mounted in the a sheltered area that is protected from rain, ideally located on the north side of the building under an eave to prevent sun-heated air from rising up the building's wall and affecting the relative humidity of the sensor. Particular attention should be given to the location of heat generating condensing units and building vent and fan exhausts. The heated air and possible contaminants associated with building exhaust could influence the transmitter's accuracy and may contaminate the sensor element, requiring its premature replacement, or that of the entire unit. A variety of humidity sensor design and types are available, however it is recommended to install humidity sensors with field-replacement tips that allow the end user to replace the sensors on-site. Replacement tips eliminate time consuming and costly factory calibration while reducing downtime during service intervals. A duct-mount style humidity transmitter's probe is easily accessed by taking off the front cover, pulling out the probe, and replacing the sensor tip. No calibration is needed because each new sensor module is computer calibrated at the factory before shipping. Another benefit for duct and outside air applications is that the sensor module can be replace without removing the unit or disconnecting the wiring conduit. These factors contribute to a more user friendly, lower-cost product that is focused on customer needs and ease of use. 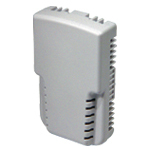 The humidity sensor is one element of multifaceted HVAC system. Each element-whether it's the damper, cooling coil, supply fan, hot water valve, or humidity sensor-must work in harmony with all the other parts to provide a comfortable environment in which both temperature and humidity levels are always within specified ranges. CLICK HERE to view The Importance of Measuring Building Humidity Whitepaper Series (Part 3).